Winter Work – Dig Delve – An online magazine about gardens, landscape, growing & making. Winter is a productive season here in Britain. The weather rarely closes in to stop us for more than a few days and, with the garden in stasis, there is room to think and plan and do. The few truly dormant weeks saw us clearing another fallen tree in January, logging the wood for the winter and stacking the brush into piles (main image) that will become home to the creatures, lichens and fungi that like the protection and decay. If we have snow the tracks to and from the stacks advertise their occupancy but, where the surrounding grass gives way to the shelter within, there are already signs of the annual cleavers that climb into their cages and clothe them in summer. 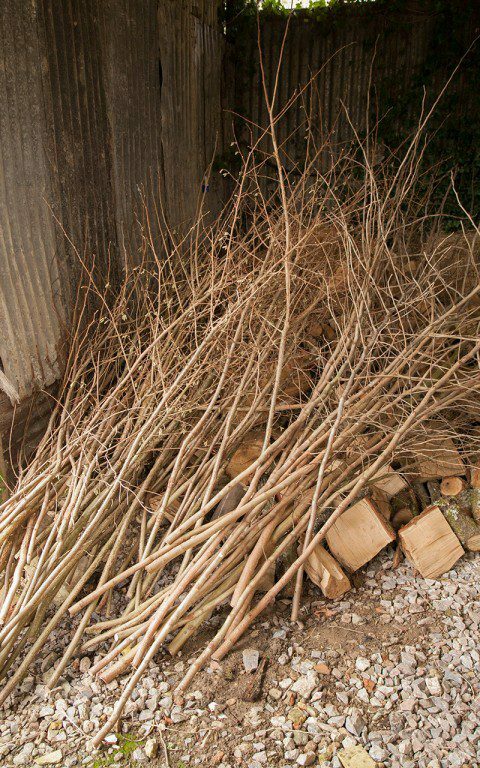 Before the hedges were cut we harvested a few bundles of hazel to provide twiggy support for broad beans and sturdy poles for the sweet peas and climbing beans. They are a welcome bounty and the result of cutting the hedges every other year to allow them time to flower and berry. Two years is just enough time for the oldest and strongest hazel in the hedge to push out a good length of twiggery. 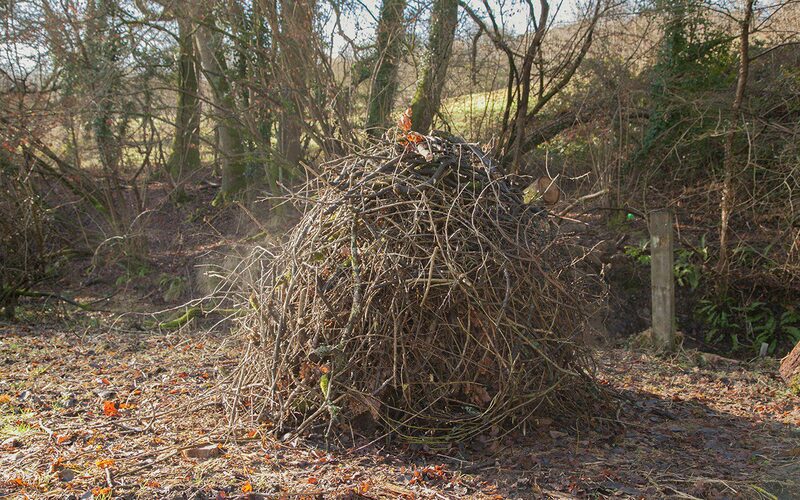 Next year, whilst the hedges are growing back, I will coppice a couple of our freestanding hazel. It is hugely gratifying to be self-sufficient for plant supports for the garden. 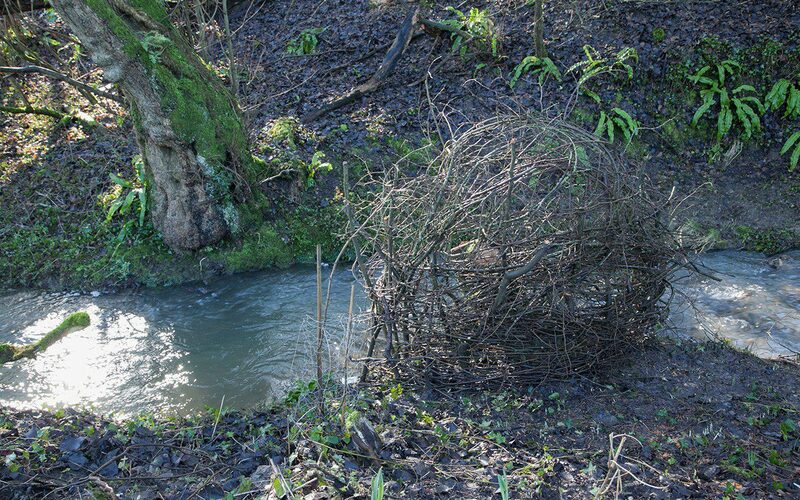 Whilst they are regenerating the hazel stumps are protected from the nibbling of deer with woven cages of offcuts. 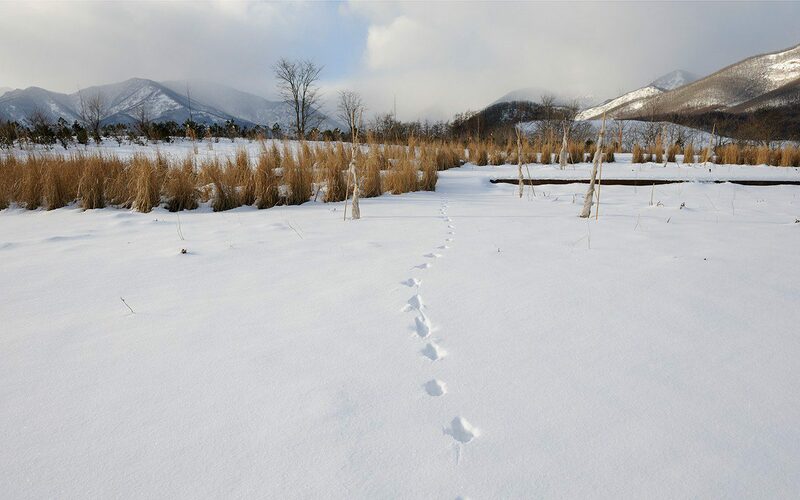 Though we complain here about the winter’s duration, I cannot help but compare these few fairly benign months to the harsh conditions at my project in Hokkaido. There the gardeners have to leave the frozen landscape in search of work whilst the garden lies beneath deep snow until late April. The rush of tasks to either side – in preparation for the slumber and then the great surge of activity in spring – is palpable in head gardener Midori’s communications. Meanwhile, here we are free to dig and prune and plant. What luxury it is to get things in order with these few weeks of down time on our hands. It has been a busy winter for I am readying myself to plant up the first sections of the new garden that was landscaped last summer. This time last year the same ground lay fallow with a green manure crop protecting it from the leaching effect of rain and to keep it ‘clean’ from the cold season weeds that colonise whenever there is a window of growing opportunity. The winter rye grew thick and lush, except where the diggers had tracked over the ground during the previous summer’s building works, where it grew sickly and thinly, indicating that something needed addressing before going any further. When we started the winter dig, the problem that the rye had mapped became clear. Not far beneath the surface the soil had become anaerobic, starved of air by the compaction and with the tell-tale foetid smell as you turned it. The organic matter in the soil had turned grey where the bacteria were unable to function without oxygen and the water ran off and not through as it should. Turned roughly at the front end of winter, like a ploughed field, the frost has since teased and broken this layer down and the air has made its way back into the topsoil to keep it alive and functioning. 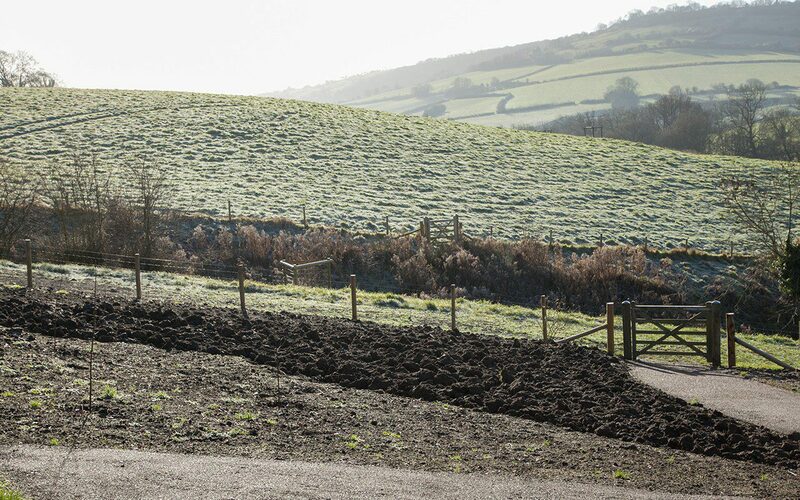 Though it is still too wet to walk across, you can see that the winter freeze and thaw has worked its magic and that, as soon as we have a dry spell, it will knock out nicely like a good crumble mix, in readiness for planting. Time taken in preparation is never time wasted and it is a good feeling to give new plants the best possible start in their new positions. As the soil was previously pasture and we have the advantage of heartiness, the organic content is already good enough, so we will not be digging in compost this year. I want the plants to grow lean and strong so that they can cope with the openness and exposure of the site rather than be overly cosseted or encouraged to grow too fast and fleshy. Organic matter will slowly be introduced after planting in the form of a weed-free compost mulch to keep the germinating weeds down and to protect the soil from desiccation. The earthworms, which are now free to travel through the previously compacted ground, will pull the mulch into the soil and do the work for me. 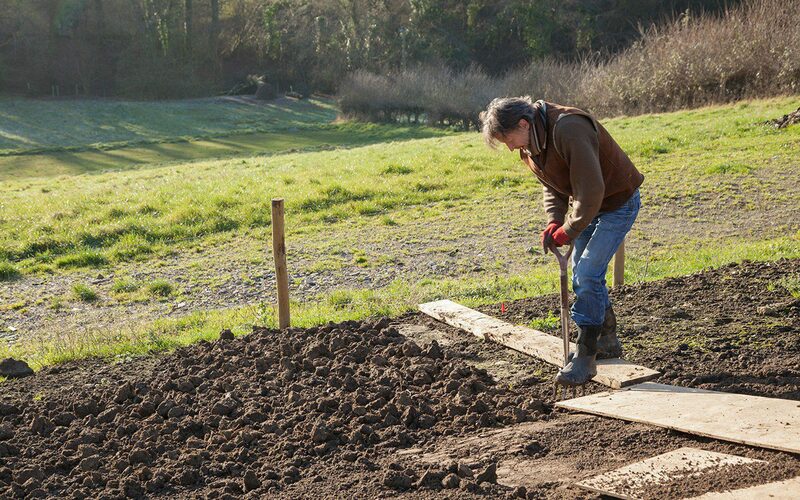 In the vegetable beds, where we have been working the soil and demanding more from it, the organic matter is replenished annually to keep the fertility levels up. Our own home made compost is dug in now that the heaps are up and running. The compost is left a whole year to break down so that one bay is quietly rotting whilst the other is being filled. If I had more time, or a forklift to turn it, I would have a better, more friable compost in just six months. Turning allows air into the heap and the uncomposted material moved to the centre heats the heap more efficiently to help to kill weed seeds. My year old compost is only really good for turning in as it springs a fine crop of seedlings from the hay we rake off the banks in the summer. There are also rashes of garden plants; euphorbias that were thrown on the heap after their heads were cut in seed, bronze fennel, Shirley poppies, phacelia and a host of other plants that have lain dormant. No matter. 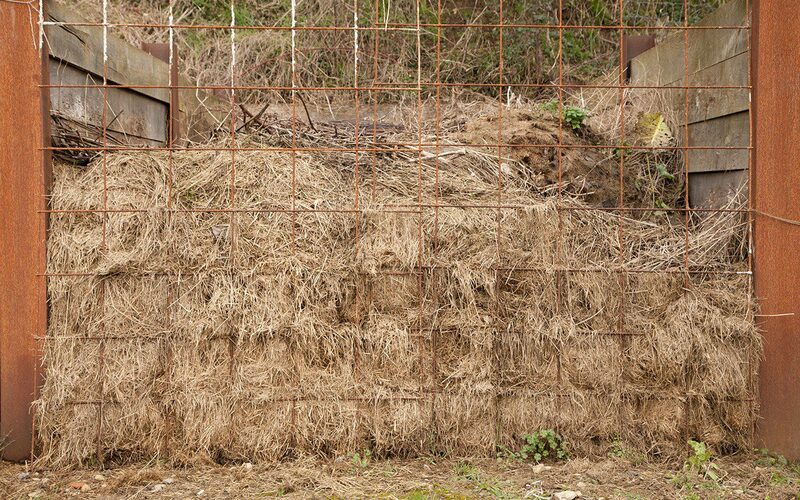 Since the heaps sit directly on the earth the compost is full of worms, and this can only be good for the soil and its future aeration. You can see the soil in the garden getting better and darker, more friable and more retentive with every year that passes. A reward for the hard work and payback for the bounty that we take from it.